Grade 8 MEA Testing GRMS 8th grade students will participate in the Maine Educational Assessment on April 24 & 25. We strongly encourage students to arrive at school fully rested and on time. PTO CRAFT SHOW Can't make the PTO Meetings but still want to help support your child's school? Consider joining our Craft Show Committee! We will meet almost entirely here on facebook (until the actual craft show on November 2) to help plan and staff our 2019 Craft Show. This event has the potential to be A HUGE fundraiser for our school. One of my favorite parts about the the event is that we are reaching beyond our school families to raise the funds. But we need more help! Help in planning, staffing the event (one day only! 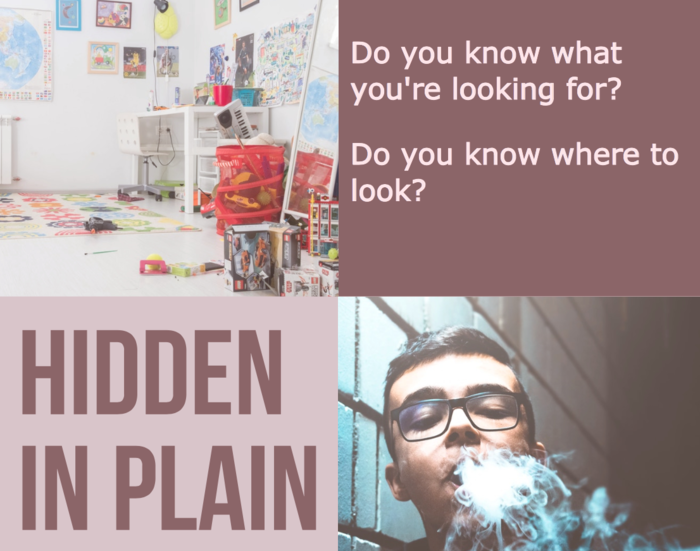 ), advertising, and most importantly, getting people to come shop! We have created a private group for you to join and help make this event big enough to be our only fundraiser of the year! Please consider lending your talents and JOIN! 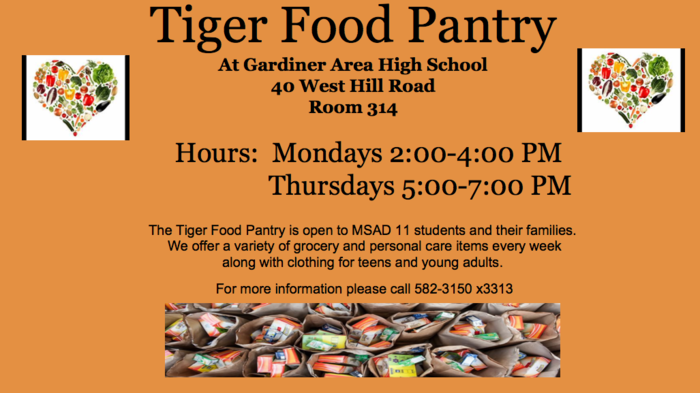 Tiger Food Pantry Gardiner Area High School Hours: Mondays 2:00 to 4:00 p.m., and Thursdays 5:00 to 7:00 p.m. THE G.R.M.S. GIFT OF GIVING As a result of a challenge issued to students and staff to “Stuff the Bus” with food items for the local Chrysalis Place Food Pantry by two Gardiner Regional Middle School Staff members, over 3,000 items were loaded into a school bus and staff members pick-up truck and delivered to the Gardiner area food pantry on December 21st. Donations of dry and canned items were collected over a period of three weeks. Included was a friendly competition among homerooms for a first place pizza party and a “runner up” cookie party sponsored by the school’s PTO. One of the two staff members who issued the challenge and desire to remain anonymous stated “We wanted ‘to stuff the bus”’ in order to provide local families and students with a good meal and continue to make a difference in our community.” This life-long learning experience provided students with the opportunity to support those less fortunate and participate in a little healthy competition along the way. One of M.S.A.D. #11 and Gardiner Regional Middle School’s goals for the year is to create strong and caring connections with the communities of the district. At this time of giving this small gesture certainly helped to make that goal a little closer to reality as the first half of the school year comes to a close. The students and staff at G.R.M.S. would like to extend this challenge to anyone reading this article. For more information about what you could do to support Chrysalis Place Food Pantry they can be reached at 582-5507. BUS NOTE Reminder...if students are going to have a change in transportation, please be sure to send your child with a note or email the school secretary. Busses will not be able to drop students at a different location without a note. Thank you. A MESSAGE FROM THE SCHOOL NURSE "Just a reminder that it is that time of year when viruses are spreading throughout our schools. Oftentimes, these viruses are most contagious before symptoms occur so please remind your child to wash his/her hands frequently. 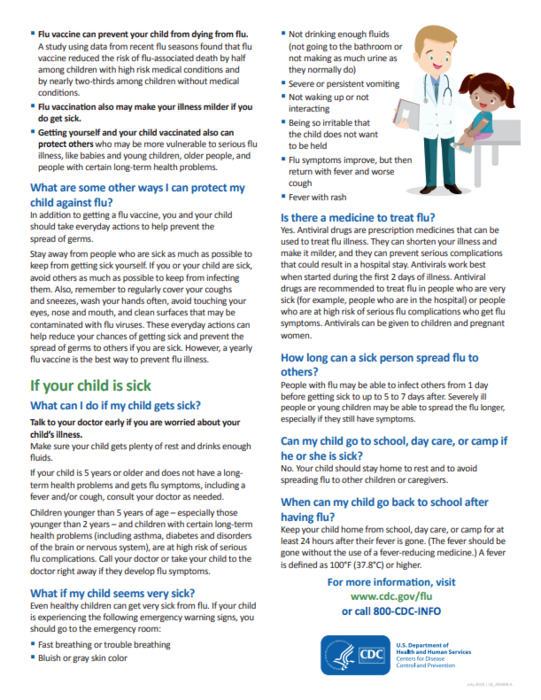 Also, please remember, if your child is sick keep him/her home. Our guidelines for MSAD #11, which are provided by our Medical Director, Abigail Hoke MD, are: 1. Temp > 100F 2. Vomiting 8 hours prior to school 3. Diarrhea 8 hours prior to school If any of these criteria are met, the student must stay home until symptom-free for 24 hours. Thank you for your help in keeping our school a healthy place to learn." 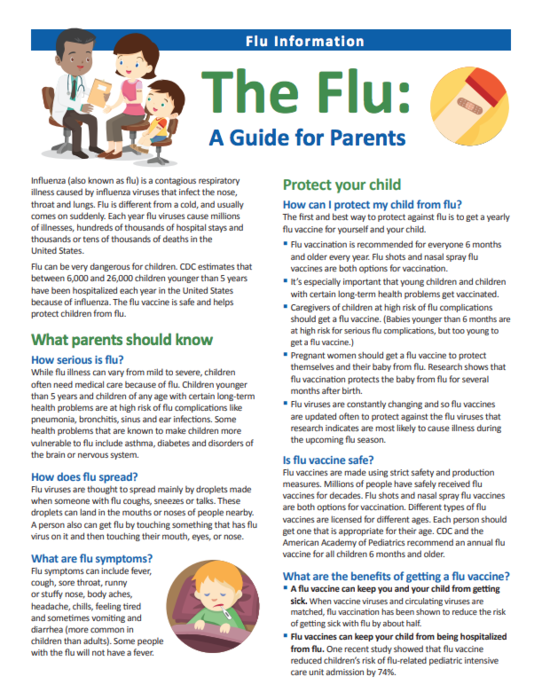 Protect Your Child From The Flu What you need to know. 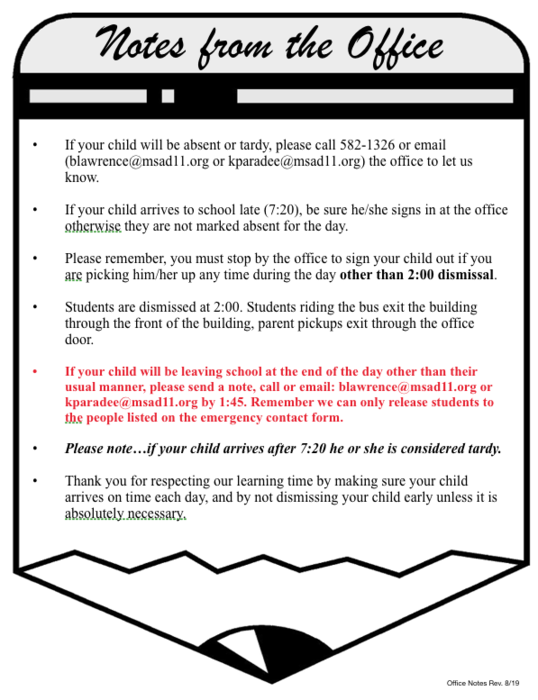 VERY IMPORTANT NOTICE If your child will be leaving school at the end of the day other than their usual manner, please send a note, call (582-1326) or email: blawrence@msad11.org or kparadee@msad11.org by 1:45. From our Middle and High School Athletic Director - Mr. Stubbert: I am very pleased to announce that the proposal I made to the school board to allow 6th graders to participate on our middle school teams and create a Varsity and Junior Varsity team passed unanimously. I think this is very exciting as Gardiner athletics move forward. The JV and Varsity format will begin this fall. Unfortunately we will not be adding any teams this year because they were not built into the budget so if a sport only has one team, it will only have one team and that will be called the varsity team. 6th, 7th, and 8th graders will be allowed to try out for that team and it will be the coaches decision on who he/she decides to keep. 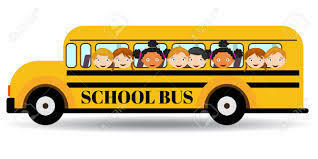 MIDDLE SCHOOL BUS ROUTES The first day of school for grades K-9 is Wednesday Aug 29th, grades 10-12 Thursday Aug 30th , and Pre-Kindergarten Tuesday September 4th. All routes are subject to time and route changes based on enrollment. The Transportation Office will be available between 6:00 am - 2:00 pm to answer questions on times and routes (582-6663). Please note: Parents need to be present at the bus stop for students PreK- 2. If your street is off any of the main roads listed, it will be necessary to walk to the main road. Listed below are the A.M. runs only, with the P.M. runs being similar in most cases. GARDINER ROUTES BUS # 645 Gardiner (Brunswick Ave., Common and Tree Streets) High School and Middle School starts at 6:38 a.m. at Highway Garage end of Old Brunswick Rd., Old Brunswick Rd., right on Armory St., left on Brunswick Ave., right on School St., left on Lincoln Ave., go around the Common to Church St., right on Dresden Ave., right on School St., left on Brunswick Ave., right on Central St., left on Upper Water St., Proceed to schools. LER School starts 7:26 at Libby Hill Rd. (Brunswick Ave. end), right on Weeks Rd., Turnaround, back on Weeks Rd., right on Libby Hill Rd., left on Marston Rd., Turnaround @ Blasting Specialists, back on Marston Rd., left on Costello Rd., right on River Rd., Turnaround @ MacMasters Ln., back on River Rd., left on Union St., left on Cannard St., LEFT on River Rd., Turnaround @ Gilley Rd, back on River Rd., right on Capen Rd., right on Marston Rd., right on Brunswick Ave., Proceed to LER. BUS # 644 Gardiner (In town areas, Common, Tree Streets., Downtown) High School and Middle School starts at 6:40 a.m. at Plummer St., left on Freemont St., right on Lincoln Ave., left on Cottage, left onto Dresden Ave., right on Church St., right on River Rd., right on Cottage Rd., right on Lincoln Ave., to Washington Ave., Proceed to schools. LER School starts at 7:35 a.m. at corner of Brunswick Ave. and High Holborn St., Left on Griffin St., T/A @ EJP, Left on High Holborn St., Right on West St., Right on Upper Water St., Right on Central St., Left on Brunswick Ave., Right on School St., Right on Lincoln Ave., Right on Fremont St, Right on Plummer St., Right on Liberty St., Right on Lincoln Ave., Left on Cottage St., Left on Dresden Ave., Right on Kingsbury St., Left on Dennis St., Left on School St., Left on Pleasant St., Right on kingsbury St., Right on Dresden Ave.,Left on Brunswick Ave., Right on Central St., Right on Pine St., Right on Washington St., Left on Beech St., Right on Neal St., Left on Brunswick Ave., Right on Water St.downtown, Proceed to LER. BUS # 634 Gardiner (Highland Ave. Area) Middle School (High School are walkers in this area) starts at 6:40 a.m. on Water St., Left on Highland Ave., Right on Hillcrest St., to Spring St. right on Bridge St., right on Summer St., right on Winter St., left on Harrison Ave. to Middle School. Riverview School starts at 7:25 a.m. at bottom of Highland Ave., left on Harrison Ave., Right on Cobbossee Ave., T/A @ GRMS, Left on West Hill Rd. Right on Highland Ave., left on Hillcrest St. continue through to Spring St., right on Bridge St., right on Summer St., right on Winter St., left on Highland Ave. to High St., Left on Terri Ln., back on Highland Ave., left on Adams St., right on Northern Ave., right on Maine Ave., left on Water St. to River Rd., Proceed to RV School. BUS # 632 Gardiner (Rte 201, LER to Richmond line) High School and Middle School starts at 6:40 a.m. on Rte 201 from Pushard Ln. to Turnaround @ Townline, back on Rte 201(Brunswick Ave.) to West St. proceed to Schools. LER School starts at 7:25 a.m. at Four Corner Church on Old Brunswick Road, right on Rte 201 (Brunswick Ave.), turn around @ Market Square Plaza Back on Brunswick Ave., Right on Old Brunswick Rd, Right on Brunswick Ave., left on West St., left on Cobbossee Ave., right on West Hill Rd., left on Highland Ave., left on Terri Ln., Turnaround, back on Highland Ave., right on Pope St., left on Pray St., go to B&G Club, right on Pray St., right on Harrison Ave.,left on Cobbossee Ave., right on West St., left on Old Brunswick Rd. to Brunswick Ave., Proceed to LER Bus # 643 Gardiner (Tree Streets and Lincoln & Dresden Ave. River Rd. to Riverview School) Riverview School starts at 7:25 a.m. start at LER, Right on Brunswick Ave., Right on Old Brunswick Rd., Right on West St., Right on Water St. and Washington Ave., left on Beech St., right on Neal St., right on Brunswick Ave., right on High Holborn St., Right on Cherry St., right on Water st., right on Central St., right on Brunswick Ave., Turnaround at LER, continue on Brunswick Ave., right on School St., right on Lincoln St., right on Liberty St., left on Plummer St., left on Fremont St., right on Lincoln Ave. left on Cottage St., left on Dresden Ave., right on School St., right on Pleasant St., right on Kingsbury St., right on River Rd., Proceed to RV School. BUS # 636 Gardiner (LER) LER School starts at 7:25 a.m. corner of West and Cobbossee Ave., T/A @ Middle School, left on Winter St., right on Harrison Ave., left on Highland Ave., left on Pope St., left on Pray St., left on Willow St., left on Clinton St., right on Spring St., right on Plaisted St., left on Autumn St., right on Spring St., right on Bridge St., right on Highland Ave., right on Mt Vernon St., left on Northern Ave., left on Adams St., left on Highland Ave., right on Harrison Ave., left on Water St., right on Cherry St., Proceed to LER school. SOUTH GARDINER & LIBBY HILL ROUTES BUS # 636 So. Gardiner (Marston and Capen) High School and Middle School starts at 6:35 a.m. on River Rd.by water treatment plant So.Gardiner, continue on River Rd. to RiverView School & T/A, left on River Rd., left on Capen Rd., right onto Marston Rd., and proceed to schools. BUS # 635 South Gardiner (Libby Hill area, Rte 24 south of RVCS) High School and Middle School starts at 6:25am at Riverview School, River Rd. (Rte 24 -So. Gardiner) to MacMasters turnaround, left on Costello Rd., right onto Marston Rd., T/A @ D&B Rock rd.,, back on Marston Rd., right on Libby Hill Rd., left on Weeks Rd., turnaround and left on Libby Hill Rd., Proceed to schools. Riverview School starts at 7:20am at the end of Capen Rd., Left on Marston Rd., T/A @ D & B Rock Rd., left on Rte. 201(Brunswick Ave), Turnaround at Richmond Line, back on Rte 201 (Brunswick Ave.) to T/A @ Lee’s Garage,, left on Libby Hill Rd., right on Weeks Rd. to turnaround, right on Libby Hill Rd., straight on Costello Rd., right on River Rd. (Rte 24) to MacMasters turnaround and back on River Rd., Proceed to RV school. RANDOLPH AND CHELSEA ROUTES BUS # 643 Randolph (Behind Hamlin School, S. Windsor st, & Kinderhook st) High School and Middle School starts at 6:25 a.m. Randolph Park and Ride, right on Water St., right on Belmont St., left around McLaughlin Terrace, back on Belmont St., left on Hillcrest St., right on Central St., left on Pleasant St., right on Windsor, left on So. Maple St., right on Elm St., left on Water St., left on Kinderhook St., left on Windsor St., right on Water St., left across Gardiner/Randolph bridge, right on Maine Ave., left on Northern Ave., left on Adams St., right on High St., left on West Hill Rd. to High School, proceed to Middle School, stopping at West Hill Apts. BUS # 631 Randolph & Chelsea High School and Middle School starts at 6:15 a.m. on Windsor St. and Togas Rd in Chelsea, Right on Route 17, Right on Windsor Rd., Left on Togas Rd to Windsor St Randolph, left on Barber Rd., T/A @ Patterson Rd., back on Barber rd., then left on Windsor St., End of Rockwood Village, right on Birmingham Rd. to Andrea Way, turnaround, right on Windsor St, right on Ridge Rd., left on Woodlawn Cr., right on windsor St., Proceed to schools. Pittston School (Randolph) starts at 7:20 a.m. at IGA in Randolph, left on Kinderhook St., right on Lewis Ave., right on Windsor St., turnaround at church, back on Windsor St., left on Barber Rd., turnaround at townline, left on Windsor St., right into Rockwood Village, right on Windsor, right on Birmingham Rd., to Andrea’s Way, turnaround, right on Nottingham Drive, left on Maria’s Way, right on Birmingham Rd., right on Brookview, turnaround, right on Birmingham Rd., right on Windsor St., right on Ridge rd., left on fairview Estates, right on Windsor St., right on Pleasant St., right on Central St., left on Hillcrest St., Right on Closson St., Left on Stevens St., Right on Lincoln St., T/A, Right on Belmont St., T/A, Right on Water St., T/A, Proceed to Pittston PITTSTON ROUTES BUS # 622 Pittston (East Of Village Store, Blinn Hill Area) High School and Middle School starts at 6:15 at church in Village on the East Pittston Rd. (Rte 194) continue on Rte 194 to Nash Rd on right, turn right on Blinn Hill Rd., left on Palmer Rd., left on Thayer Rd. to Nash Rd., right on Rte. 194 to Whitefield line turnaround, Rte 194 back to Village, left on Kelley Rd., continue to Old County Rd., turnaround, left on Kelley Rd., right on Mast Rd., left on East Pittston Rd. (Rte. 194), right on Rte. 27 to Windsor St./Water St. Proceed to schools. Pittston School starts at 7:25 a.m. on Rt. 194 E Pittston Rd., right on Nash Rd., right on Blinn Hill Rd., left on Palmer Rd., left on Thayer Rd. to Nash Rd., right on Rte. 194 E Pittston Rd. to turnaround. Back to Village, right on Hunts Meadow Rd., Proceed to Pittston School. BUS # 624 Pittston (Rte 27, Kelley Rd., Blodgett Rd.) High School and Middle School starts at 6:00 a.m. on the Old Cedar Grove Rd., turnaround, right on Rte 27 to Crocker Rd., turnaround, back on Rte 27, right the Kelley Rd., on right, turn right on Blodgett Rd., turnaround, left on Kelley Rd., right on Rte 27, left into Smithtown Rd., left on Rte 27, proceed to schools. Pittston School starts at 7:20 a.m. on the Wiscasset Rd. (Rte 27) at Turner Dr., right on Old Cedar Grove Rd., turnaround, right on Rte 27, turnaround at Crocker Rd., left on Rte 27, right on Kelley Rd. right on Blodgett Rd., turnaround at Poolman’s, left on Kelley Rd. to Rte 27, right on Rte 27, left on Smithtown Rd., left on Rte 27, Proceed to Pittston school. BUS # 621Pittston ( Whitefield Rd., Rt 126 Area) High School and Middle School starts at 6:20 a.m. at the end of the Jewett Rd., left on Whitefield rd (Rte 126) P/U to End, proceed to schools. Pittston School starts at 7:30 a.m. at the end of the Jewett Rd. Rd., left on Whitefield Rd. (Rte 126), left into Stoney Acres, left on Rte 126, right on Pinkham Rd turnaround, right on Rte 126, Proceed to Pittston school. 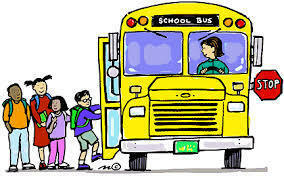 BUS # 623 Pittston (Rte 194 and Beech Hill Area) High School and Middle School starts at 6:15 a.m. on Hunts Meadow Rd. at Rte 126 end, right on East Pittston Rd. (Rte 194) to South Beech Hill Rd., straight onto Old Town Farm Rd., turnaround at end and continue back down South Beech Hill Rd., right onto Rte 194, P/U to end, proceed to schools. Pittston School starts at 7:30 a.m. South Beech Hill Rd., Old Town Farm Rd., turnaround go back, turn right onto East Pittston Rd. (Rte 194), left on Warren Rd. turnaround, left on Rte 194, right on Lancaster Rd., turnaround, right on Rte 194, left on Parker Rd., turnaround, left on Rte 194, Proceed to Pittston school. WEST GARDINER ROUTES BUS # 625 West Gardiner (Hinckley Rd. and High St. from HTS) High School and Middle School starts at 6:30 a.m. Going out High Street towards Spears corner, left on Spears Corner Rd, left on Hinckley Road, Right on High St. Pick-up at the entrances of all side roads on High St., Proceed to schools. Helen Thompson School starts at 7:30 a.m. at the corner of West Hill Rd. and Highland Ave. Pick-ups at end of all side roads unless stated herein. Left in Terri Lane, Turnaround, left on High St., right on Rabbit Ridge, turnaround, right on High St., left on Libby Ln., turnaround, left on High St.,Proceed to HTS. BUS # 626 West Gardiner ( Collins Mills, Neck, West Rds. Area) High School and Middle School starts at 6:20 a.m. at Collins Mills Rd., left on Clarks Ln., right on Neck Rd., left on West Rd., turnaround, right on Neck Rd., left on Hallowell-Litchfield Rd., right on High St. to Corner Store, Proceed to schools. Helen Thompson School starts at 7:25 a.m. at Collins Mills Rd., right on Neck Rd., T/A @ townline, right on West Rd., T/A @ Wentworth Cove, back on West Rd., right on Neck Rd., left on Hallowell/Litchfield Rd., right on High St., right on Hinckley Rd., right on Spears Corner Rd., Proceed to HTS. BUS # 627 West Gardiner ( Benson Rd.+ Spears Corner Rd. Area) High School and Middle School starts at 6:25 a.m. at Helen Thompson School, left on High St., right on Hallowell-Litchfield Rd. to Butternut Lane turnaround, right on Benson Rd. turnaround at town line, right on Hallowell-Litchfield Rd, left on Town House Rd., cross onto Spears Corner Rd., left on Rte. 126 (p/u between Spears Corner Rd. and Indiana Rd. ), Proceed to schools. Helen Thompson School starts at 7:20 a.m. at the Boys & Girls Club. Go to the Lewiston Rd. (Rte 126) and start pick up from the Indiana Rd. out to 4 corners, right on Spears Corner Rd., left on High St., right on Hallowell-Litchfield Rd., turn around at Butternut Lane, right on Benson Rd., turn around at town line, right on Hallowell-Litchfield Rd., left on Townhouse Rd., Proceed to HTS. BUS # 628 West Gardiner (Rte 126, Bog Hill, Indiana, Pond Rds. areas) High School and Middle School starts at 6:25 a.m. at corner of Bog Hill Rd. and Rte. 126, left on Bog Hill Rd. left on Indiana Rd, right on Rte. 126, left into Windy Acres, right on Rte. 126, left on Old Lewiston Rd., right on Pond Rd., turnaround Litchfield line, right on Old Lewiston Rd., Proceed to schools. Helen Thompson School starts at 7:15 a.m. at corner of Pond Rd. and Old Lewiston Rd., go down Pond Rd. to turnaround, right on Old Lewiston Rd., left on Rte. 126, right into Windy Acres, right on Rte. 126, left on Indiana Rd., continue straight onto Bog Hill Rd, left onto Rte. 126 to Citgo turnaround, left on Spears Corner Rd., left on Dunn St., Turnaround, left on Spears Corner Rd., Proceed to HTS. CHELSEA ROUTE BUS # 648 (Chelsea, Windsor and Part of Randolph Run) High School starts at 6:20 a.m. from the Gardiner Bus Office and proceeds out Windsor St. and Starts to pick up in Chelsea on the Togus Rd. The takes a right on Eastern Ave and picks up Windsor Students at Miller’s Used Auto. Then left on Windsor Road and then left on Togus Rd to Windsor St. in Randolph, P/U from Chelsea Town Line to Water St. in Randolph, Right on Water St P/U @ Jones St.,Proceed to schools. 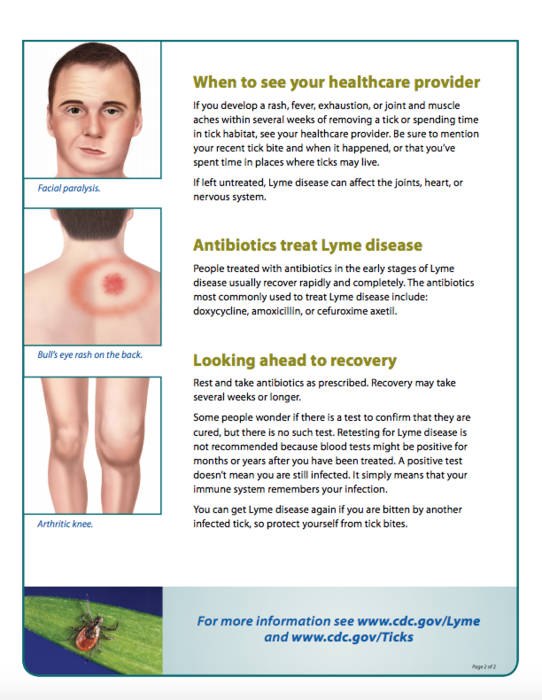 TICKS AND LYME DISEASE Ticks and the diseases that they carry are an ongoing health concern in our area. Please be sure to check yourself and your child after coming in from outside. 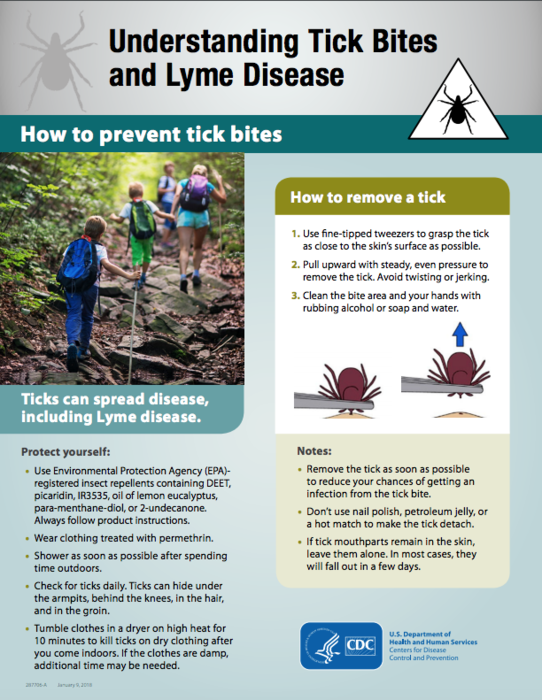 The following information provides basic but important information from the CDC on ticks and lyme disease. NOTES FROM THE OFFICE: If your child will be leaving school at the end of the day other than in their usual manner, please send in a note or email blawrence@msad11.org and kparadee@msad11.org by 1:30. Box Tops for Education Please remember to collect and send in your Box Tops for Education! GRMS Team Newsletters Please visit the "Document" section on the Middle School Webpage to obtain access to the team Newsletters.